Repairs, servicing and sales of new and vintage sewing machines and overlockers is what we specialise in. Allmake changed hands in 2010 from "All Make Sewing Centre". Still a family business since 1956, Damien and Wendy are determined to bring a fresh approach and a younger attitude to the sewing industry while still offering good old fashioned service to our customers. At Allmake, we aim to provide you genuine advice and service on your new or old sewing machine. We are authorised BERNINA, Q20, PFAFF, Horn, AccuQuilt and Singer dealers and have a range of services aimed at making your sewing experience a satisfying one. 2014 Gold Award for "Excellence in Customer Service"
Heinz and Margrit Leuenberger took over Allmake in 1987 and began a sewing revolution in Adelaide which took the state and PFAFF Australia by storm for the next 20 years. They travelled far and wide supporting country towns at field days, and servicing machines wherever they went. They set up sewing machine agencies throughout the state, training and teaching all they knew. They got so enthusiastic that they set up their own local and successful sewing show called the Sewing, Craft and Overlocker Show (SCO), for local and interstate traders to bring their products to the sewing community in an affordable way. With time came the opening of the Creative Cottage two doors down whose rooms were filled with fabrics, and held hundreds of classes annually. Their hard work and dedication to Allmake and their customers brought them much satisfaction, so when their daughter and son in law began to show interest in taking over the store to make it their own, they were delighted. In 2010 after much training and guidance from Heinz and Margrit, the hand over was official. Wendy and Damien have settled into the business in a very professional way so much so that they are on the verge of once again revolutionising the sewing industry to absolute new standards in quality and integrity. Their enthusiasm to provide service to their very own high criterions, positions their shop well above today’s norm. Heinz Leuenberger in the 90's. providing the people of Adelaide all of their sewing needs. 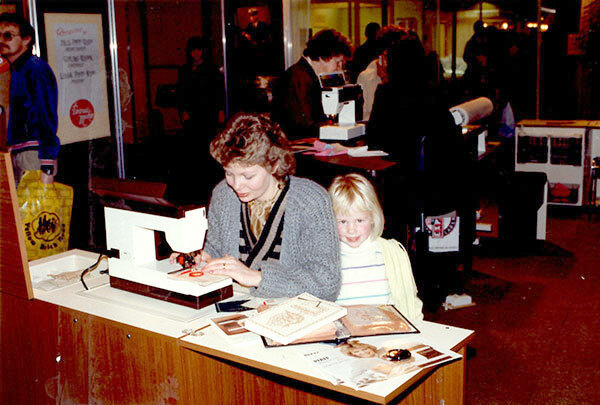 A very young Wendy with her mum, Margrit at the SCO Show. Supporting BERNINA since the beginning. Heinz did a 4 year apprenticeship as a Tool Maker and specialised training on sewing machines at the SWISS-BERNINA Factory in Steckborn, Switzerland, before coming to Australia in 1980 with his wife Margrit. Along with his experience with PFAFF, this allowed him to train several young men into assistants in his workshop. It is only natural that BERNINA is making its presence felt at Allmake by way of a great range of machines, accessories and active workshop at Allmake. We love getting to know our wonderful, local customers and building an ongoing friendship with them as we help them with all of their sewing needs. "Damien & Corrie, for your very special way of being, as you apply yourselves to the need of your customers. That you listen and hear, before searching for what is available, to fit the situation and with such a warm, willing, generous attitude. Truly a blessing. May God bless you both always, thank you again." "All the staff are very friendly and informative. Their customer service is excellent. They were very helpful giving me the opportunity to use different machines with different fabrics to help me decide on which machine would suit me sewing needs. I cannot rate them highly enough." "Thank you so much Wendy for the private sewing lesson. I feel so much more confident on my new machine and I absolutely love my PFAFF Quilt Expression 4.0!" "Great service. Reconditioned old Singer machine that belonged to my grandmother!" Local stores we love to support. We believe that buying local and supporting local is what will keep our community thriving in the field of sewing, and keep jobs in South Australia. It is through local stores that we can gather knowledge, understanding and experience the genuine passion for sewing. There are some great stores in and around Adelaide, if you are new to sewing or didn't know about them, these are certainly worth visiting. Natural, sustainable and simply beautiful fabrics for garments, soft home furnishings and wearable crafts. Jane and Fiona have a lovely store full of stunning fabrics, fun projects and ideas. For craft, patchwork, dance and dress. Tricia has a warehouse full of theme patchwork fabrics, current quilting fabric, loads of accessories and books and is open 7 days a week. Sales and repairs of industrial sewing machines. Lyn and Rob restore and repair lovely old machines. Sales of leather, all sorts of hooks, studs, buckles and belts. Alterations, made to measure, bridal fabrics and dry cleaning – these guys have a solution for all your sewing projects!